These words occur in one of a series of five ‘woes’ – messages of judgment in the form of laments, recorded in Habakkuk 2:6-19. 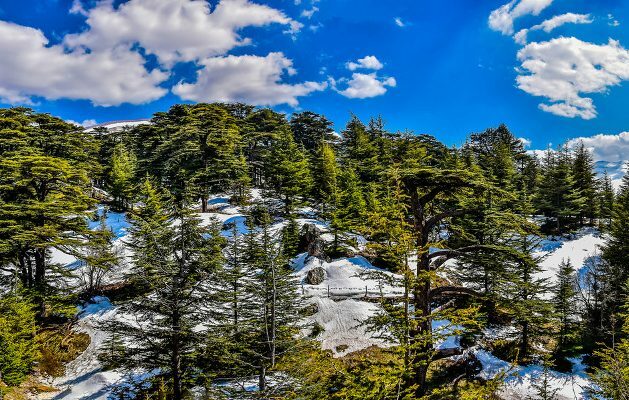 ‘Lebanon’ is usually taken to refer to the region’s famous cedars. In Psalm 104:16 these cedars are singled out within creation as being planted by God himself. But what does ‘the violence done to Lebanon’ signify? Until very recently interpretation generally took one of two paths. The first saw ‘Lebanon’ as symbolic. The Victorian scholar E.B. Pusey took it to be a reference either to the land of Israel or the temple, or more widely to worldly imperial power. Interestingly, he is anticipated in this view by the sixteenth-century reformer John Calvin. More recent comment has often centred on the uses to which the timber of Lebanon was put: for example ‘constructing military machines and buildings’. (Achtemeier, 1986). Any reference to ecological responsibility has been slow to develop. In his Word Commentary published in 1984, Ralph L. Smith coyly asks, ‘Is there an ecological message in this verse for us?’ (Smith, 1984). But seven years later J.M.M. Roberts splendidly relates the verse to humanity’s ecological responsibility – ‘humanity’s abuse of its authority over creation’. “It is one thing to rule over creation, respecting it as God’s creation entrusted to one for the moment…; it is quite another thing to exploit it unmercifully as though it belonged to one absolutely, as though one were not accountable for it to its creator.” (Roberts, 1991). The case for this application is made all the stronger by the following reference to ‘the destruction of the animals’ – whether these are beasts of burden employed to carry timber, or creatures destroyed along with their forest habitat. in order to gaze on their nakedness! A connection is naturally made with Genesis 9:20-23 where Ham saw his father Noah naked and told his two brothers Shem and Japheth. The two brothers respectfully covered their father’s nakedness while not observing it, and are commended for their respectful action. We may suspect that some sexual activity is involved, both in Genesis and in Habakkuk, since ‘uncovering the nakedness’ has this significance elsewhere in the Old Testament (e.g. Leviticus 18:6-19; 20:11, 17-21). But in any case the conduct referred to is abusive. Abuse is the keynote of the whole section, and culminates in verse 17 where its objects include Lebanon, the animals, human bloodshed and the earth, cities and their inhabitants. In all these cases similar abuse is widespread also in our own world, where it is amplified by developed technology and communication. The fact that the relevance of the passage to responsibility for creation, so obvious today, was passed over in earlier comment, points to a crucial lesson about biblical interpretation: the messages you get from scripture depend on the questions you ask. Could the virtual neglect of ecological mission in the church – general until very recently, still prevalent in many places – be caused by our failure to come to the Bible with the right questions? We should approach scripture with the community of creation in mind, as well as being concerned with spiritual, social and political issues. Elizabeth Achtemeier, Nahum-Malachi, John Knox Press, 1986. Ralph L. Smith, Micah-Malachi, Word Books, 1984. J.J.M. Roberts, Nahum, Habbakuk, and Zephaniah, Westminster/John Knox Press, 1991. Keith Innes was in parish ministry from 1958 until his retirement in 1997. Since then he has studied and written on biblical eco-theology. His notes “God, the Earth and Humanity in the Book of Micah” and “British and American attitudes to nature” are available on the JRI Briefings page of this website.